This time around we have a Ruger® Mark I Target Model pistol. The serial number on this gun is 17-36534, which tells us this gun was manufactured on January 26, 1982. The pistol has never been sold and has not been fired beyond normal test firing during manufacture. The Mark I Target is a .22 Long Rifle caliber pistol with a 9-shot magazine. It has a two-stage trigger pull, and the trigger is grooved with a 3/8” wide curved finger surface. Other features include a 6-7/8” tapered barrel; windage and elevation adjustable click rear sight and an undercut front sight; black, hard rubber, impact resistant grip panels with a gloss finish, sharp diamond checkering and silver Ruger® eagle medallion on the right panel. The pistol will be shipped in a one-piece black and yellow hinged cardboard box along with a 9-shot magazine, original instruction manual and original marketing literature. The pistol is being sold “as is,” and the purchaser assumes all liability for its safe and proper ownership, storage, use, and resale. Please note that the winning bidder of this auction is responsible for paying the Federal Excise Tax. 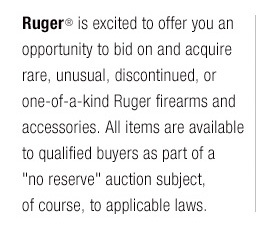 The pistol is a part of the Ruger factory collection in Southport, Connecticut, and a certificate of Authenticity will be mailed to the winner. Discharging firearms in poorly ventilated areas, cleaning firearms, or handling ammunition may result in exposure to lead and other substances known to the State of California to cause birth defects, reproductive harm, and other serious physical injury. Have adequate ventilation at all times. Wash hands thoroughly after exposure.